2 King Beds, 2 Queen Beds, pullout sofa bed. Finished basement w/ Large screen TV, Pool table and pullout sofa bed. 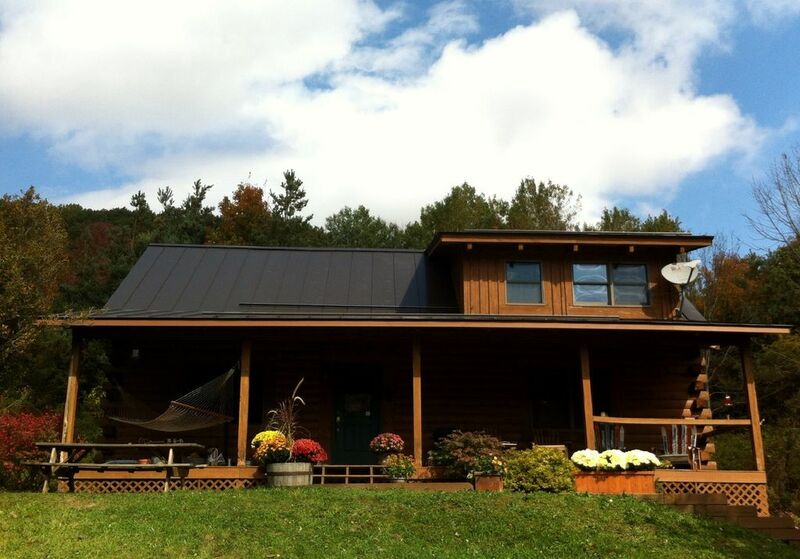 This cabin is nestled on a very private hillside overlooking the BEST views in Ellicottville! Panoramic views of surrounding Mountains from the large covered front porch. The Cabin is set back from the road just enough to feel completely secluded while still enjoying the convenience of being just 5 minutes from Village! The Hot Tub is built in to the back deck and is 100% private backing up to the Mountain with no neighbors in sight. There are no street lights for miles, so the star gazing at night is the best you will see all year! Born and raised in Buffalo, NY I graduated from the University of Buffalo and reside in Williamsville, NY. Buying this cabin was the best decision I ever made and have countless memories with friends and families. I have gone out of my way to make the cabin as comfortable as possible and enjoy hearing how much our guests enjoy their stays. I am easily accessible by phone or text during your stay and have 15 years of renting experience. The #1 reason I bought this cabin is the amazing views and feeling of seclusion. Being only 5 minutes from the village of Ellicottville and only 10 minutes to Holiday Valley make this home the perfect location to balance both privacy, peace and quiet with access to all of the excitement and entertainment the area has to offer. The finished basement provides the perfect getaway for the kids to enjoy TV or playing Billiards while the "grown-ups" enjoy the cozy confines of the main living area, or enjoy the Hot tub together under a blanket of stars! Furnace forced air heat with WiFi thermostat. All beds have fresh linens with backup sheets available in closet and chest. Long driveway with parking pad at bottom of driveway so you won’t block each other in. High speed WiFi with password at check in. More than enough towels will be provided. Keurig Machine or Cuisinart coffee maker are both available. Plenty of dishes, glasses, utensils, pots and pans are all provided. Large HD TV in Basement Rec Room and HD TV in Main Living Room both have DTV receivers. Upstairs bedroom has TV for DVD watching. Direct TV with premium channels and DVR in Living room and finished basement! Bar Pool Table in finished basement Recreation Room! Very private Hot tub built in to the backyard deck surrounded my trees with amazing star gazing views! We were looking for a comfortable getaway for 6 women to reconnect and relax, we were not disappointed! It was a beautiful rustic home, close enough to town to grab a bite to eat or do some shopping. Hint: Villagio on Monroe in Ellicottville is FABULOUS and not to be missed. But far enough away to enjoy the beauty and solitude of the country. The house was clean, well appointed and comfortable so socializing and enjoying a good nights rest was easy. The hot tub was spectacularly clean and a fabulous respite from the cold. We also enjoyed lounging on the front porch and were rewarded with a plethora of wildlife for entertainment. Although we didn’t have children with us, the lower living room would have been great as an additional area for families. The owner, Tom, was super helpful and accommodating. I am glad to hear that you enjoyed yourselves and had such a good time. I appreciate you, and your group taking such great care of the house. You are all welcome back anytime. The cabin was a great place to stay for our 4 day weekend/ski trip! The cabin was clean, spacious, and had everything we needed. The kitchen/living/dining area was a nice big open space for everyone to hang out at the end of the day with an additional space in the basement with pool table. The hot tub was so nice to relax in as well. No issues with bugs or hot water. Nice quiet location/setting - close to town and close to ski hills. Tom was a great host! We will be back next year! Thank you for the kind words. We are so glad your group enjoyed the home. Thank you for taking such good care of our home. We look forward to hosting you again. We had a wonderful experience. The house was clean and full of everything we could need for cooking, linens etc. It’s a beautiful rustic wood place very close to town but far enough away where you can enjoy the nice views and trees surrounding you from the hot tub. The property owner was great and very responsive to us. We look forward to coming back for another ski/getaway weekend. Would recommend. Thank you for the kind words Anne. We are so glad you enjoyed the home and had a nice weekend. You were wonderful guests and very considerate. We look forward to hosting your group in the future. All the best! The place was great as well as the owner. Tom, the owner, was quick to respond and extremely helpful anytime we had questions or concerns. He also gave recommendations on places to go in town which was very helpful. The pictures of the cabin certainly did it justice and was just as we expected when we showed up. We definitely enjoyed our time there and next trip we plan to Holiday Valley we'll definitely be booking Tom's cabin again. I would highly recommend this property. We had 4 couples for an adult ski weekend and it was a perfect fit! Tom was great as well. We will be back. We are glad you enjoyed your stay and look forward to hosting your group again. The Cabin did not compare to the photos. The guest bedroom upstairs was a box spring and mattress on the floor. Down stairs tub had mold. We ended up not staying. Again, I am sorry that we were unable to accept your cancellation request on such short notice, but writing this completely unfair and inaccurate review of our home, is not the way to handle the situation. We take great pride in our home and make every effort to provide our guests with a very comfortable environment and enjoyable experience. All of the other reviewers comments reflect this fact. The few minor issues you brought to my attention upon your arrival, were taken care of within a few short hours. Unfortunately, you chose to not respond to my text messages and decided to just leave. I can only assume this was planned all along due to our not accepting your late cancellation request which was outside of the clearly stated policy. We have been renting our home for the last 18 years and have never once had a guest leave such feedback. We take great pride in our home and go to great lengths to make sure our guests are comfortable and enjoy their stay. This cozy Log Cabin is situated on a scenic mountainside overlooking a beautiful pair of mountains and valley. The home backs up to woods and has a private deck with hot tub. 2 miles away is Ellicottville with many shops, restaurants and bars.